Converting Migrating Transferring Recovering SoftCo PCDoc. We undertake to release the documents and data from the PCDOC storage and database systems for interoperability purposes so that it is easy to move in to a more modern system, or stand alone as a licence free archive. We can also recover data from damaged files and disks. PC-Doc by Softco is utilised by many companies for Document Management Typically located in the office are scanners to facilitate the scanning of various sizes of documentation A4 A0 etc. PC-Doc may also store computer files directly such as MS Word, Excel PDF or other Microsoft Office type files just as a computer hard disk or CD would do. The PC-Doc client software enables the indexing and insertion of relevant information (metadata) about each scanned tiff image or computer file. This data is then made available when the document is retrieved or searched for. Scanned images may be stored on MO disks, Optical digital juke box or Hard Drive Central Cache files and archived at regular intervals. Scanned index information may be backed up to internal PC-Doc database or an external database eg Microsoft SQL to allow easy web access. Vendor Lockin was not really recognised as a problem when these systems were first sold and companies shelled out large amounts of money to buy into the paperless office dream without fully appreciating the consequences. Over time technology and file formats change and they now find themselves almost renting their data rather than owning it due to licensing agreements renewals. In some cases file formats are no longer supported when the vendor goes out of business. Vendor lock-in is a big concern for the IT department. Business continuity will suffer if that vendor goes out of business and you can no longer buy a licence. When we perform a migration, we aim to release the clients data from the proprietary locked format of PCDoc for interoperability purposes. This allows easy importing and viewing with commonly available software. Storing records in a non-proprietary / open file format ensures that the files will still be supported in 25, 50 or even 100 years. In contrast, the PCDoc file format is controlled by a single vendor, which invites a lot of unnecessary risk for IT and information governance. We can tailor the output of the Database to say CSV file, or text, in different layouts to make it easier for direct use or import into the new system. We have a tried and tested system of on-site work which has met the satisfaction of Military, Health Care Services, Police and IT Contractors. We have Non Disclosure Agreement forms, or we can work with your own organisation's NDA. pcdoc migration conversion transfer recovery problems that we recover data from are listed below. converting pcdoc, transfer pcdoc, migrating pcdoc, recover pcdoc files. 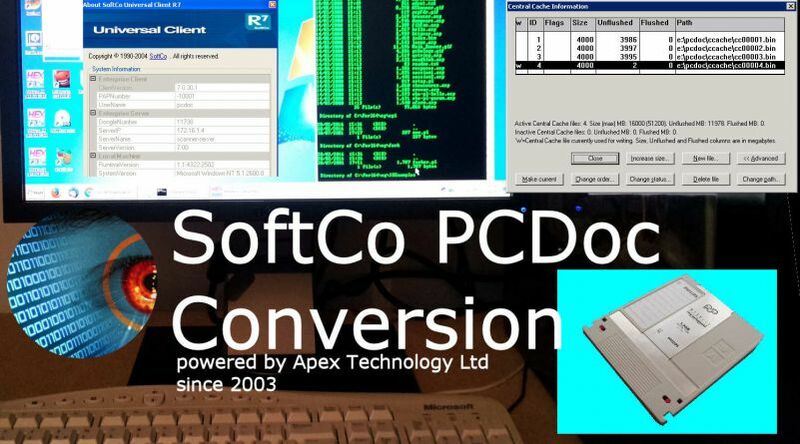 converting migrating transferring recovering Softco PC-DOC MO Disks Optical Disks Hard Drive Files to PDF TIFF for import export document management system.